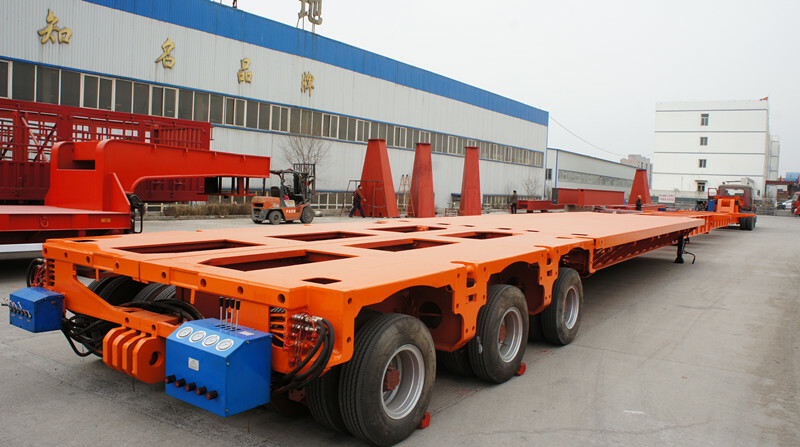 Wind blade trailers, roter blade trailers for sale from China, specialized for transportation of wind energy industry components and construction of wind power stations. HugeIron is a manufacturer and supplier of specialized transport equipment, offers one stop solution for all kinds of difficult transport jobs. Wind power is an ECO and renewable energy, no fossile fuel consumption, no carbon emission and air pollution. Windmill plants construction is booming all over the world. SinoTrailers provide all types of wind blade trailer and custom made trailer for wind power industry use. Besides nacelle, wind tower section and other windmill parts, wind blade is long and lightweight, also fragile and tender. How do make a safe and efficient transport for those blades is our trailer’s purpose. Below trailer is similar to Goldhofer’s wind blade trailer. Custom-design trailer is also welcome in our factory.